The E-DWT-H is at home in metrology and calibration labs, on the production floor or in the field. It can operate with a wide selection of test mediums, including Sebacate calibration fluid, mineral oil, water and other liquids. ± 0.02 % of reading total one-year measurement uncertainty rivals the best laboratory deadweight testers. 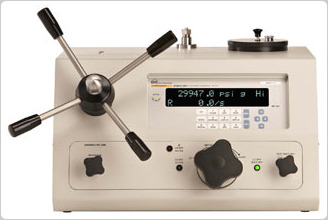 The E-DWT-H is used in the lab or instrument shop or can be taken into the field for performing in-situ calibrations and tests. This hydraulic pressure calibration system combines a high performance electronic reference pressure monitor and manually operated pressure generation and control hardware in a single, compact and rugged package. E-DWT-H offers the ease of use and precision of continuous, real time electronic pressure measurement with the simple and direct pressure control of high quality manual pressure hardware. 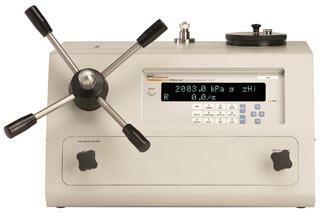 E-DWT is named “electronic deadweight tester” because it is intended as a lightweight and easy to use, modern alternative to conventional piston-cylinder and weight based deadweight testers. The E-DWT’s electronic reference pressure monitor is a special version of RPM4, designated RPM4-E-DWT. RPM4-E-DWT can be configured with one or two high precision quartz reference pressure transducers (Q-RPTs) with ranges from 7 MPa (1 000 psi) to 200 MPa (30 000 psi). The RPM4-E-DWT is controlled locally by the operator using its front panel display, keypad and optional foot pedal or remotely by a computer using ASCII character command strings over its RS-232 interface. RPM4-E-DWT uses an AutoRange feature to automatically select the most appropriate Q-RPT and to optimize the E-DWT-H setup to cover the desired range of operation. When two Q-RPTs are included, a half-turn valve isolates and protects the Lo Q-RPT from high pressure when the Hi Q-RPT is in use. Visual and audible indicators assist the operator in setting the shut off valve correctly. The E-DWT-H includes the hardware necessary to fill and prime the system under test and generate and precisely adjust pressure up to 200 MPa (30 000 psi). The E-DWT-H can be powered with an optional battery/charger pack for use in locations where AC power is not readily available. Fluke Calibration electronic deadweight tester kits feature E-DWT-H configurations combined with the accessories needed for a complete calibration system. Model 6531 options feature E-DWT-H configurations with a single quartz reference pressure transducer (Q-RPT) to offer percent of reading performance from 10 % to 100 % of device full scale. Model 6532 options feature an additional Q-RPT to maximize workload coverage, with percent of reading performance from 1 % to 100 % of device full scale. An included vacuum fill kit allows the E-DWT to be filled with your choice of compatible fluid, while eliminating problematic air pockets from the test circuit. Also included is a test station adapter to mount just about any pressure device to be tested without using PTFE tape or wrenches. 6531 and 6532 kits provide all you need to perform high level hydraulic pressure calibration right out of the box. Operating medium All 6531 and 6532 E-DWT Kits are shipped dry, standard preparation. Can be filled with di-ethyl-hexyl sebacate, silicon oils, propylene glycol, fully fluorinated liquids, partially fluorinated liquids, isopropyl alcohol and distilled water or mineral oil. TEST pressure connection DH500 female, 200 MPa (30k psi) maximum working pressure. Adapters included for 1/8 in, 1/4 in, 3/8 in and 1/2 in NPT, 1/8 in, 1/4 in, 3/8 in and 1/2 in BSP, M20 x 1.5 and M14 x 1.5. Adapter maximum working pressure is 140 MPa (20k psi). Note: DH500 is a gland and collar type fitting for 6 mm (1/4 in) coned and left hand threaded tubes equivalent to AE F250C, HIP HF4, 9/16-18 UNF, etc. 1. Combined linearity, hysteresis, and repeatability. Precision does not include stability or calibration reference uncertainty. 2. Predicted Q-RPT measurement stability limit (k=2) assuming regular use of AutoZero function and short term stability between rezeroing. 3. Maximum deviation of the Q-RPT indication from the true value of applied pressure including precision, predicted stability with rezeroing, temperature effect from 10 ºC to 40 ºC and calibration uncertainty (assumes calibration reference uncertainty of ±0.005 % of reading, k=2), combined and expanded (k=2) following the ISO “Guide to the Expression of Uncertainty in Measurement.